Instructions for Verification of AP SSC Online Students' Nominal Rolls 2018, Guidelines on Online Students' Nominal Rolls 2018 Corrections, AP SSC Online Students' NRs Data Corrections, SSC NRs Check list corrections, Last date for submission of corrected NRs, Corrected Online Students' Nominal Rolls submission schedule. 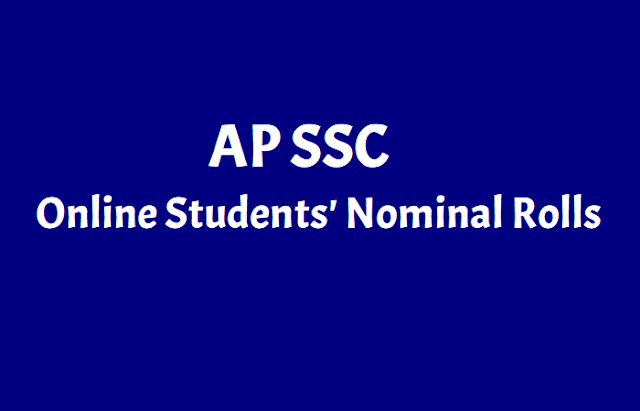 The school wise particulars of the candidates registered for SSC Public Examinations, March 2018 will be on the website http://main.bseap.org/. Handover the corrected copy to the DyEO concerned for their onward transmission to the DEOs who in turn will submit the same to O/o DGE, A.P., Hyderabad. • Hall Tickets will be generated to only those candidates whose data is put on the website. • Hall Tickets cannot be generated for those whose photos are not uploaded. • Candidates with wrong photos will not be allowed to the Examination Centers. If any discrepancy in the photo and signature of the candidate are found, it has to be brought to the notice of the DGE through the following Phone Numbers for their edit.